Spring Airlines is a Chinese based Low-Cost Airline, do not expect free meals! Instead, they offer a great range of pre-order meals at great prices, and they also offer a buy on board menu on most flights. It’s been well documented that their online prices are reasonable when compared to other airlines. 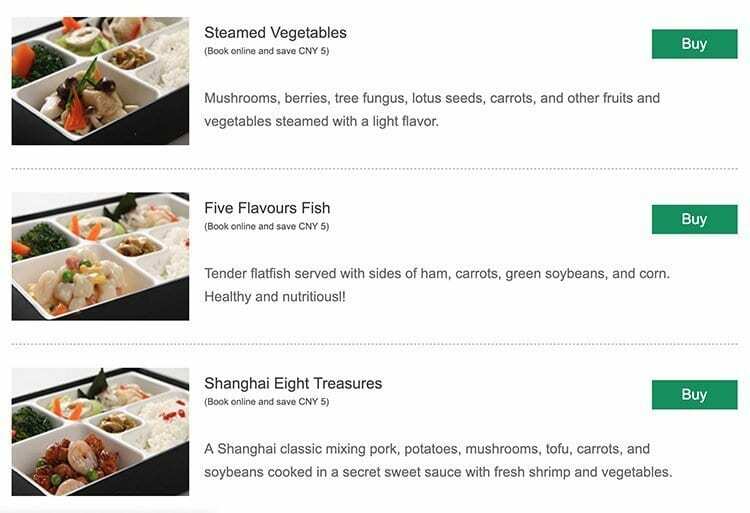 If you pre-order your meals online the airline offers discounts of up to CNY5 off each meal. You can pre-order your meals when booking your flight ticket, if you forget to do so you can pre-order from up to 4hrs to 36 hours before departure. On flights where it’s not possible to pre-purchase hot meals, the airline offers a range of hot meals for sale. If you need to change your pre-order choice you can do so up to 36 hours before departure.